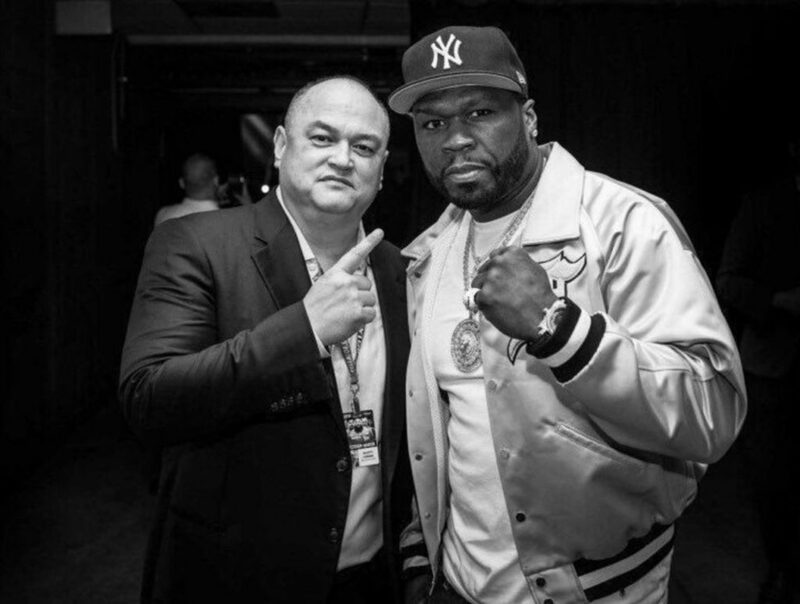 LOS ANGELES – Bellator MMA, a global combat sports leader owned by Viacom, has joined forces with entertainment superstar and business mogul Curtis “50 Cent” Jackson on an extensive partnership and licensing deal featuring a new apparel line based upon Jackson’s popular “Get The Strap” trademark and integrating Jackson’s elite champagne brand, Le Chemin du Roi in future Bellator events. A passionate and knowledgeable MMA fan, Jackson has already agreed to re-invest a portion of his deal by offering one million dollars in cash to the winner of the upcoming Bellator Welterweight World Grand Prix that will air exclusively on DAZN. “We are thrilled to partner with such a legendary icon who has been a friend to the Bellator family for quite some time. The “Get The Strap” apparel line is just the beginning of many joint ventures we will explore together,” said Scott Coker, President of Bellator MMA. “I am excited to partner with the Bellator Viacom franchise. Mixed martial arts yields some of the most action-packed events in the world. I’m excited for people to see how I plan to shake up MMA with the integration of my ‘Get The Strap’ trademark as well as my luxury champagne Le Chemin du Roi.” said Jackson. Leveraging his viral “Get The Strap” moniker, Bellator and Jackson will launch a global apparel line that will be fashionable and edgy, with distinctive attitude. Also, Jackson’s popular new champagne, Le Chemin du Roi, will become fully integrated into Bellator events from in-arena signage to mat placements and more. 50 Cent, born Curtis James Jackson III, is an award-winning rapper, entrepreneur, actor and producer from Queens, New York. Recognized as one of the most talented and prolific music artists of his time, the Grammy Award winner rose to fame with his record-shattering debut album, Get Rich or Die Tryin’ and has since sold more than 30 million albums worldwide and been awarded numerous prestigious accolades. Jackson has leveraged his star power to cross over with unparalleled success as an entrepreneur, actor and producer. From Get Rich or Die Tryin’ being one of the fastest selling albums in history to creating one of the most influential deals in hip-hop with the sale of Vitaminwater, Jackson continues to break records. He currently has the critically-acclaimed #1 show on Starz, “Power,” in which he not only co-stars but also serves as executive producer and director leading into season six. The exceptional businessman serves as CEO of G-Unit Records, which he founded in 2003 and has since signed a host of multi-platinum artists. Jackson continues to dominate the charts with hits like the recently released “Still Think I’m Nothing,” and he is continuously recording new music. Jackson continues to extend his brand, which encompasses a broad spectrum of businesses including: footwear and apparel, fragrance, video games, publishing, headphones, Le Chemin du Roi champagne, vodka, health drinks, Casper mattresses and supplements. Jackson was represented on this deal by Stephen J. Savva and Eric Feig.